The importance of virtual reality (VR) shouldn't be taken lightly, as the Internet was once a debate. This is the future and we should learn from past experiences with the Internet. 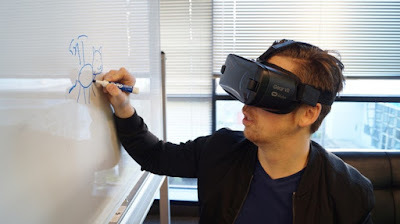 Here you will find 9 Fantastic Ideas on how to apply VR to your business. It is estimated that by 2020, the economic impact of virtual and augmented reality is predicted to reach $29.5 billion. It's evident that VR is being adopted in the marketplace at a rapid pace, and adding this capability to your existing portfolio of marketing channels is something you must consider to stay current in the ever changing ever growing competitive space for business. What Is VR VR, is short for virtual reality, is a form of interactive software that immerses users in a three-dimensional environment to simulate a real experience (This is achieved with the help of some hardware). Ideally, VR allows people to simulate the experience in 360 degrees. Numerous industries are now finding uses for VR. Some examples include the transport people to places they might otherwise have to travel to, or simply imagine. While movie companies, for example, are giving audiences the opportunity to experience the movie as if they're the actual character in the scene, and conventional businesses are now using VR to demonstrate and promote their products to potential customers to give them a more immersive experience and a more vivid illustration on what they intend to communicate. Before we dive into some of the businesses that have found success injecting their marketing with a dose of VR, it's worth noting that virtual reality has a few key differences from another term you might've heard before: augmented reality. As a designer and manufacturer of food processing systems, Key Technology created a VR demo system that would allow any attendee to experience a more detailed, hands-on look at how the company's VERYX digital food sorting platform works and how it will help them. Another great VR initiative we recommend is Step To The Line: A short film (that was immersively viewed on a VR headset) documenting the lives of inmates at California maximum-security prisons. Created by Within, a VR storytelling production company, in partnership with Defy Ventures, an entrepreneurship and development program for men, women, and youth who are currently or were formerly incarcerated. The objective of this viewing experience is to help viewers to uniquely see what life is like within the walls of these correctional facilities, from the yard, to the cells, to the conversations that take place there. There is knowledge that For far too many people, injuries, age, and disease can diminish mobility and equilibrium to the point where walking is extremely painful to nearly impossible. Pairing this special chair with a Gear VR headset allows users to more intuitively move their bodies (thanks to the chair's combined neuroscience-based and ergonomic design) while virtually experiencing day-to-day experiences with a rehabilitative use of their hands and legs. IT is more often than not for any first-time buyer. Even if you know of the unfathomable power of paperwork and finances to undermine the fun of designing or decorating a new home. That is, until you walk into one of 19 Lowe's stores that features the Holoroom How To VR experience. Some homeowners are lucky enough to pay a professional to renovate their home when it needs to be. For others -- Lowe's core buyer -- the next stop is the world of do-it-yourself (DIY) home improvement, which comes with its own hefty dose of stress. That's why Lowe's decided to step in and help out homeowners -- or recreational DIY enthusiasts -- with a virtual skills-training clinic that uses HTC Vive headsets that guides participants through a visual, educational experience on the how-to of home improvement. We discovered that the cheese brand Boursin once created a VR experience to take users on a multi-sensory journey through a refrigerator to shed light on its products' flavor profiles, food pairings, and recipe ideas. The goal: to raise awareness among U.K. consumers of Boursin's distinct taste and product selection. While the VR installment was part of a live experiential marketing campaign, the rest of us can get a taste -- pun intended -- of the virtual experience via this YouTube video. In 2017, Adidas partnered with Somewhere Else, an emerging tech marketing agency, to follow the mountain-climbing journey of two extreme athletes sponsored by TERREX (a division of Adidas). And what good is mountain climbing to an audience if you can't give them a 360-degree view of the journey? Viewers were able to follow the climbers, literally rock for rock and climb along with them. You heard that right -- Using a VR headset and holding two sensory remote controls in each hand, viewers could actually scale the mountain of Delicatessen right alongside Rueck and Miller. This VR campaign, according to Somewhere Else, served to "find an unforgettable way to market TERREX, [Adidas's] line of outdoor apparel & accessories." What the company also did, however, was introduce viewers to an activity they might have never tried otherwise. Instill an interest in the experience first, and the product is suddenly more appealing to the user.